Slovenia , officially the Republic of Slovenia is a nation state in southern Central Europe, located at the crossroads of main European cultural and trade routes. It covers 20,273 square kilometers and has a population of slightly mote than 2 million. It is a parliamentary republic and a member of the United Nations, European Union, and NATO. The capital and largest city is Ljubljana. The territory is mostly mountainous with a mainly continental climate, with the exception of the Slovene Littoral that has a sub-Mediterranean climate and the north-western area that has an Alpine climate. Additionally, the Dinaric Alps and the Pannonian Plain meet on the territory of Slovenia. The country, marked by a significant biological diversity, is one of the most water-rich in Europe, with a dense river network, a rich aquifer system, and significant karst underground watercourses. Over half of the territory is covered by forest. The Slovene lands were part of the Austro-Hungarian Empire until the latter's dissolution at the end of World War I. In 1918, the Slovenes joined the Serbs and Croats in forming a new multinational state, which was named Yugoslavia in 1929. After World War II, Slovenia became a republic of the renewed Yugoslavia, which though communist, distanced itself from Moscow's rule. Dissatisfied with the exercise of power by the majority Serbs, the Slovenes succeeded in establishing their independence in 1991 after a short 10-day war. The first stamp of independent Slovenia was issued on 26 June 1991 and was dedicated to Independency declaration. Yugoslav stamps were valid for postage in Slovenia until 25 April 1992. Since 1993 Post of Serbia issue fossil stamps regularly. Click on image to enlarge it or to for detailed description, when exist. Click on year number to see all Paleontology and Paleoanthropology related stamps issued in the year. 07.05.1993 "Fossils of Dolzan Gorge" 29.03.1995 "Karavankina schellwieni" 21.03.2000 "Fossils - Trilobite"
21.03.2001 "Fossils - Starfish Fossil" 21.03.2002 "Fossils - Insect from the Oligocene" 24.03.2004 "Fossils - Oligocene Fish"
24.03.2006 "Middle Miocene Fossil Snail"
25.03.2016 "MAMMAL FOSSILS IN SLOVENIA: Cave Bear" 17.03.2017 "MAMMAL FOSSILS IN SLOVENIA: Cave Lion"
23.03.2018 "MAMMAL FOSSILS IN SLOVENIA: Mastodon" 22.03.2019 "MAMMAL FOSSILS IN SLOVENIA: Anthracotherium"
[A1] In 1995, the excavations of the archaeologists of the Scientific Research Centre of the Slovene Academy of Sciences and Arts (SRC SASA) unearthed a perforated thigh bone (femur) of a juvenile cave bear (Ursus spelaeus) from the cave bear bone accumulations of the Divje Babe I Cave Site situated over the hamlet of Reka in western Slovenia. The artifact discovered was later recognized as possibly the oldest flute in the world, dating back to the middle of the last Ice Age, which began 115,000 years ago and ended with a long-lasting warming 10,000 years ago. [A2] Joint issue with Austria. Postojna Cave is a 24,340 m long karst cave system near Postojna, southwestern Slovenia. It is the second-longest cave system in the country (following the Migovec System) as well as one of its top tourism sites. Postojna Cave was carved by the Pivka River over millions of years. Some fossils of Cave Lion depicted on Slovenian stamps in 2017 are found in the cave. More info about the cave is on Wikipedia. [A3] Official release says "He was interested in several other fields, including geology, palaeontology, botany, ethnology and the Slovene language." More information wanted. [P1] Issued by the sculptor of the statue. [P2] Issued by philatelic club of Kamnik. 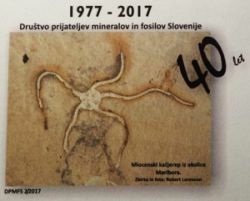 [P4] On occasion of 40 anniversary (1977-2017) of the Friends of Minerals and Fossils Association of Slovenia, two personalized self adhesive stamps and two correspondent FDC are issued. Lower Permian beds of Dovžanova soteska (near Tržič). Miocene (Mid. Miocene, Badenian) brittle star from vicinity of Maribor town. All fossils and minerals are from Slovenia sites, shown on one of FDC covers. 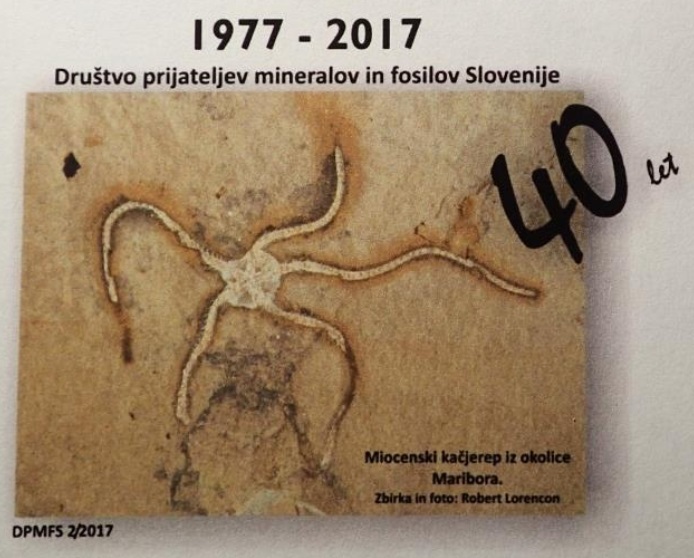 Note: the brittle star is one of the best preserved fossil (for echinoderm fossil) in Slovenia. Sphaeroschwagerina carniolica is from fossil site (Dovžanova soteska) near Tržič, the place where the Friends of Minerals and Fossils Association of Slovenia is based. Dovžanova soteska is the most known fossil site in Slovenia. [PSA1] Amber is fossilized tree resin, sometimes small insects, leafs, hair or feather of some animals preserved inside of amber. In 2016 tail of a 99-million-year-old dinosaur, including bones, soft tissue, and even feathers found in Amber in China.